Prior to loading production to the line (for a new style) Industrial Engineers prepare an operation bulletin (OB) for the style. In the operation bulletin, IE plans calculated manpower and machine requirement based on SAM of all operations (pitch time) and production target per hour (or per day). This is known as calculated (or theoretical) machine requirement. In the calculated machine numbers, fraction of machine number may come but practically fraction of machine cannot be set in the sewing line. In the operation bulletin, IE also plan actual machine requirement for each operation. See the following image. Where possible, operations are clubbed (where similar machine type is required) for balancing available time per machine and SAM of operations. But for all operations balancing is not possible. That is why in the OB, IE gets variation in between two figures - calculated machines and actual machine numbers. Total variation of the machine numbers for a style is known as balancing loss. An example: For label attaching operation computerized single needle lock stitch machine is used. Compared to other operations, SAM of this operations is low. As a result target production is achieved in less than given hours. So for this machine/operator doesn't have work for full day. This machine would not be used for other operation too. So line will loss his/her productive time. For a particular operation (label attaching) balancing loss can be improved by increasing production target. But to meet increased target in one operation, one may loss balancing in other operations. See in the following sample operation bulletin of a Polo Shirt. Calculated machine number and allocated machine numbers are respectively 26.42 and 29. Variation of machine numbers is 2.58 machines. Calculation Procedure of balancing loss% for style setting is explained below. Calculate machine number based on operation SAM and Production Target per day. For detailed procedure of calculating machine requirement in the OB read this article. Allocate machine to each operation. Only enter nearby round number for allocated machine. (The computed machine is rounded to the nearest integer. Any value less than n.50 is rounded down to the integer "n". Any value equal to or greater than n.50 is rounded up to the integer "n+1". For example, calculated machine number 1.25 results in 1 and 1.70 results in 2. Find the difference between number of allocated machine and number of calculated machine. Online Clothing Study: What is Balancing Loss in Garment Production? 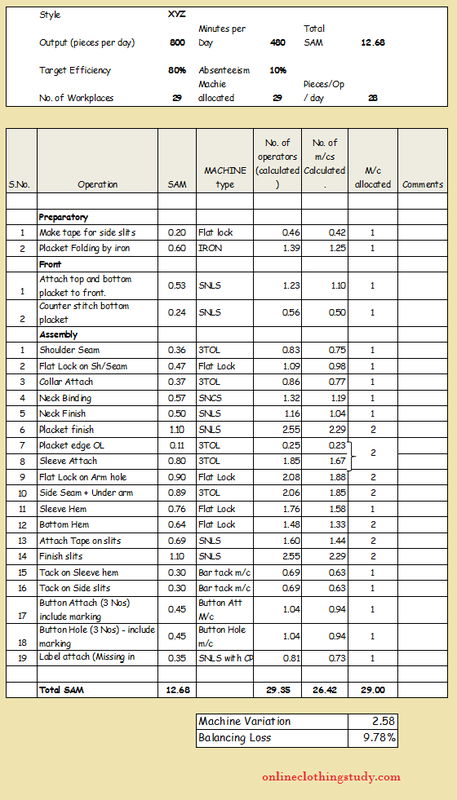 Balancing loss in garment production and calculation procedure of balancing loss percentage.